plant based detroit. 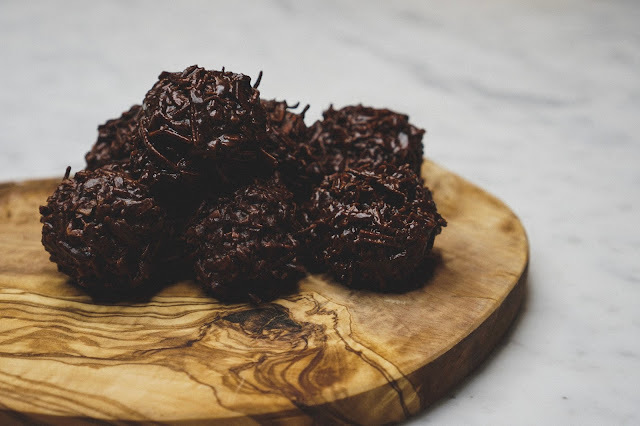 : COCONUT CACAO TRUFFLES. These truffle balls are addictively delicious. Luckily they're made with raw cacao powder, coconut oil and natural sweeteners that are packed with antioxidants, healthy fats and minerals! I brought these into the office and was left with an empty tupperware container within about 10 minutes. Add all ingredients except coconut flakes to a saucepan on very low heat. Whisk together until melted/combined. Turn off heat and fold in coconut flakes. Allow mixture to cool a bit, then with wet hands, roll tablespoon scoops of mixture into balls. Place on/in tray or Tupperware lined with parchment paper. Store in fridge or freezer (if you can resist eating them all). Adapted from this Kimberly Snyder Recipe.